We are delighted to announce that Blarney GAA have once again been awarded with a Gold accreditation in the Coaching Benchmarks. There are a number of targets which are to be reached in order to obtain this award. 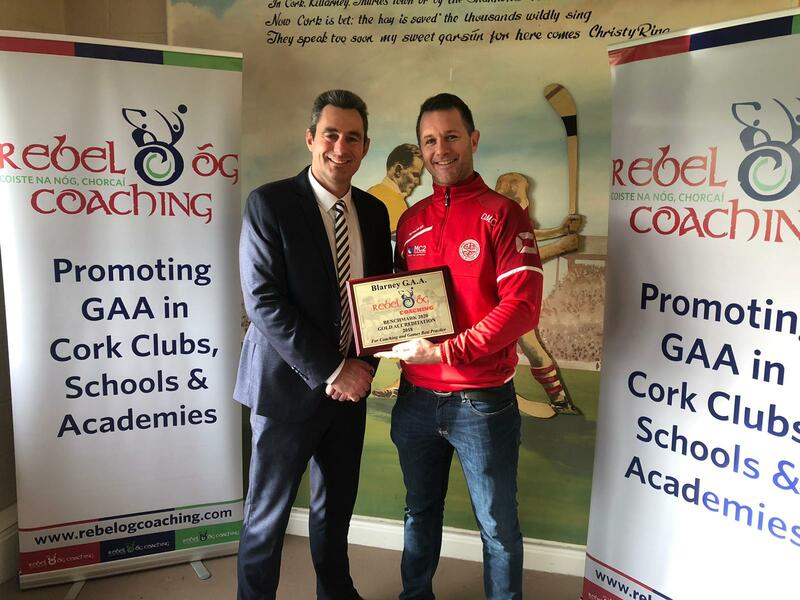 Rebel Óg Coaching Benchmarking 2020 was successfully launched in early 2015 and provide a template for best practice in coaching, promoting maximum participation and optimal playing standards in juvenile clubs throughout Cork city and county. The programme includes minimum requirements for entry, with subsequent progression to Bronze, Silver or Gold targets, which clubs would strive to achieve with the assistance of their local GDA. Bronze criteria are based on establishing a primary school coaching and games programme in schools within a club’s catchment area. Silver criteria are based on an appropriate programme of club coaching and games for 5-12 year olds, while Gold criteria are based on appropriate coaching and games for 13-18 year olds. Targets must be retained on an annual basis and clubs can progress along the spectrum of targets from year to year. Thus a progressive coaching pathway for clubs is incorporated, with optional elements also listed for clubs who wish to strive for even higher standards. Clubs who do not wish to enter the programme will retain access to all individual elements of the programme, such as Monster blitzes or coaching courses, however, GDA priority will be given to clubs who are implementing an integrated club coaching plan under the programme. The minimum requirements for entry include some essential club structures for the implementation of any coaching plan. Also, a requirement for all clubs to host a Kellogg’s Cúl Camp is included. The Cúl Camp must be organised according to the nationally approved guidelines outlined by Croke Park. ‘Urban’ exceptions may be necessary in terms of schools, which do not fall within any club catchment area. In such cases external resources may be devoted to fill any gaps. Below, Club na nOg Chairperson Dave McCarthy accepting the awared on behalf of the club.